CQRS helps create task-based UIs, naturally maps to business contexts and use cases, and it makes reporting a lot easier. The concepts of event sourcing (ES) and command-query responsibility segregation (CQRS)have been around for quite a while. They are getting more and more attention in the Java community, though they seem to have been much more popular over on the .NET side. I am going to write more about some of these pieces in the future. Before we get there, let’s start with a brief introduction to event sourcing and command-query responsibility segregation. Either one or the other, never both. For example, if a command changes anything in the system, it should not be used to read its state. Mutation-free read access should always be possible. Asking a system to change something to read a value seems plain wrong, andqueries inadvertently changing state are very confusing, surprising and leading to bugs at best. These principles can be applied on all levels. Uncle Bob in “Clean Code” calls it one of the main principles of good function design. The pattern is also applicable to system design. In short, it means that all data in the system is stored in the form of events, in an event log. An event is a piece of information stating that something has occurred (user created, name changed, shipping address added, order submitted, order delivered). They’re always in past tense, saying that something has happened. The events never change. You can never delete or update them. If something has happened, it’s happened. If it was a mistake, it can be corrected with a complementary action generating a new “inverse” event, but there’s no going back and saying it has not happened. Event sourcing and command-query responsibility segregation perfectly fit each other. It’s a powerful synergy effect: each of them becomes more powerful thanks to the combination. When a command comes in, the domain model calculates the new state of the system and possibly emits some new events (which are the only way the changes are persisted). When another command comes in for the same logical area, the domain model is restored from the past events, and responds to the new command by generating some new events. The events represent concrete changes that have business meanings. Technically in a sense they are “deltas” (or “diffs”) of the system state. CQRS naturally leads to task-based UIs. Every action represents some very concrete business event. There can be a huge difference between changing someone’s name, changing their shipping address, or making them a gold customer. If end user wants to change name, they get a small form that has exactly what is needed for that operation. If they make a customer gold – that’s another action in another form. Contrast this with the traditional CRUD, spreadsheet-like systems. They have no such operations as “change name” or “change customer status to gold”. All the users can do is “change user”. Implementing logic that changes something when a particular field changes all of a sudden becomes harder. Validation is a nightmare. Auditing and simply seeing when something happened and what the users did, is impossible without adding more layers of complexity on top. 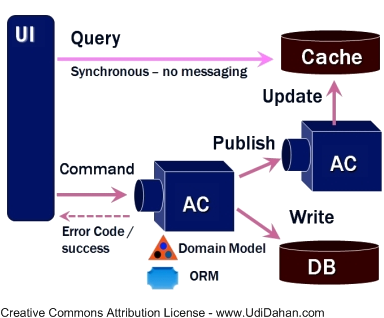 Related to the above, and a reason why CQRS is often used with domain-driven design, is that the shape of the system naturally maps to business contexts and use cases. Commands correspond to concrete user intents, and queries are designed to answer concrete questions. Once again, it’s the exact opposite of a glorified spreadsheet-like DB frontend. It’s applicable on higher level, too: Different areas of the business (bounded contexts in the DDD lingo) can be implemented as separate models. For example, a warehousing context can represent a book in a completely different way than a sales context. One may be interested in its size, weight and number on stock. The other – in author, genre, cover image, publisher description etc. Answering such a change in a “traditional” system would be a nontrivial effort. With ES+CQRS chances are that all it will take is just another straightforward projection of data that is already there, and immediately answer questions about the past! Finally, another obvious benefit is performance. Since the view models are separate, they can have very different schema. Avoid joins, keep data denormalized, answer many questions in linear or even constant time. Read-only access is much easier to scale, as is the write side which doesn’t care about queries anymore.